As evidenced from the studies just described, there are a number of different ways that researchers have attempted to estimate cigarette smuggling rates. The research design, data sources and type of statistical analysis employed all impact these estimates. While some of the estimates cited above differ from our previous analyses and the most recent results that are described below, many of them do roughly line up with our results. While there’s no “right” estimate, it’s encouraging to see that many of the analyses that have been conducted typically come to similar conclusions. 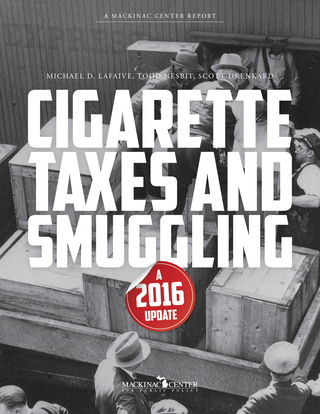 Cigarette smuggling — inspired by tax evasion or avoidance — is a significant problem in many areas of the country. Our most recent estimates, using the latest available data at the time of this written — through 2014 — find the states with the highest inbound smuggling rates are New York (55.4 percent), Arizona (49.6 percent), New Mexico (46.2 percent), Washington (45.2 percent), Minnesota (35.5 percent), California (30.9 percent), Massachusetts (29.3 percent), Utah (26.8 percent), Wisconsin (26.6 percent) and Texas (25.9 percent). The state of New York has been a perennial number one in our rankings. Its high state excise tax rate of $4.35 per pack combined with New York City’s $1.50 tax per pack and its proximity to lower taxed states (Pennsylvania and Virginia, for example) all contribute to its high smuggling rate. But Arizona and New Mexico are not far behind, both with smuggling rates within 10 percentage points of New York’s. There is an important point worth discussing concerning the smuggling rates in Arizona and New Mexico. The statistical model used in this analysis contains an international component which attributes a certain amount of smuggling from Mexico or to Canada. Based on discussions with law enforcement, we have come to believe that some percentage of illicit cigarette trafficking that the model attributes solely to being smuggled in from Mexico may in fact be passing through bonded warehouses, having entered the United States from some other country. A bonded warehouse is a way station of sorts where international goods are processed before being dispatched within the United States. It is all too easy — we are told — for some percentage of international cigarette shipments that land in bonded warehouses to get diverted for smuggling purposes. We believe our overall smuggling rate is accurate, but based on this information, it is possible that the percentage of smuggling from Mexico to Arizona (18.2 percent) and New Mexico (22.2 percent) is overstated. The same could be said for California and Texas, which our model attributes 18 percent and 19 percent of illicit traffic coming from Mexico, respectively. Through 2014 the states with the highest net outbound smuggling export rates are New Hampshire (81.1 percent), Idaho (24.8 percent), Virginia (24.4 percent), Delaware (23.9 percent), Wyoming (21.2 percent), West Virginia (19.5 percent), Indiana (17.4 percent), Nevada (17.0 percent), Missouri (13.3 percent) and North Dakota (11.7 percent). New Hampshire clearly stands alone in terms of outbound smuggling, according to this analysis. This may be surprising, because it levies a relatively hefty $1.78 excise tax on packs of cigarettes. Its status, however, as cigarette export king is likely a function of being sandwiched between Vermont with its $3.08 tax per pack and Maine with its $2.00 tax per pack. In addition, Canada, directly to the North, imports a small percentage of New Hampshire smokes too. Our model takes smuggling into Canada into account and incorporates those exports from a state’s overall smuggling rate. We estimate that for every 100 cigarettes consumed in New Hampshire an additional six are smuggled into Canada. The states in our study with the biggest year-over-year upward moves by rank are Massachusetts and Minnesota which leapt 15 and 11 spots — Massachusetts is now 14th and Minnesota fifth. Both states enacted large state excise tax increases in 2013 by $1.00 and $1.60, respectively, and so their climb up the rankings is not surprising. Minnesota has actually raised its cigarette taxes again in 2015 by 7 cents and the again by 10 cents earlier this year. The North Star State adopted a law to facilitate automatic cigarette tax increases based on inflation in 2013, which we expect will put constant upward pressure on smuggling and other unintended consequences. Minnesota’s neighbor, North Dakota, maintains an excise tax rate of only 44 cents. The tax differential between these two states probably goes a long way in explaining North Dakota’s top-10 cigarette export rate of 11.7 percent. The biggest notable drop in rankings was from Rhode Island, which saw its rank drop from fifth in the nation in 2013 to 19th in 2014. The likely reason for the drop was not due to its own efforts, but instead to the $1.00 cigarette tax increase in Massachusetts. With higher excise taxes in a neighboring states, Rhode Islander’s had one less attractive option for acquiring less expensive cigarettes. 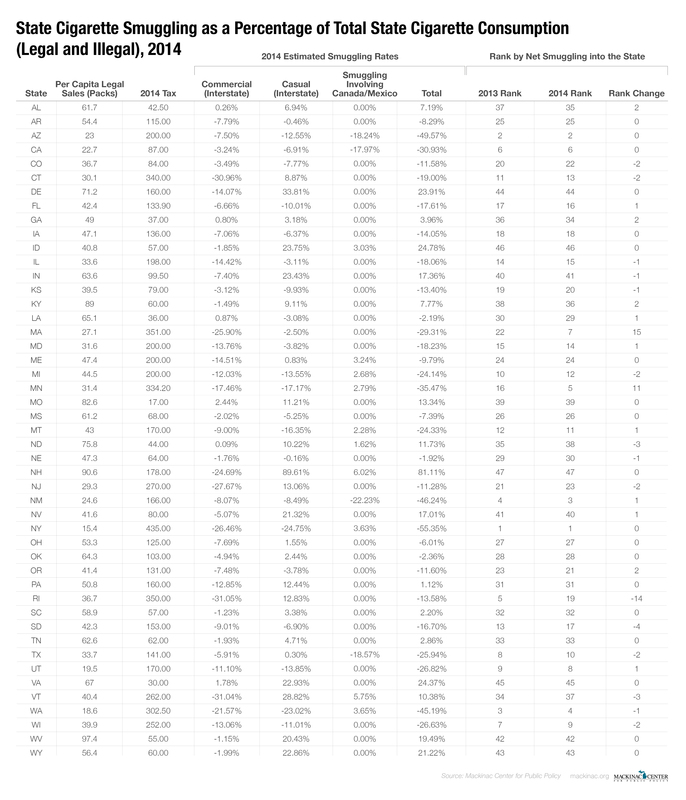 The table below shows the full results of our statistical analysis.